On 28th June 2018, nearly a thousand women occupied the Hart Senate Office Building in Washington, DC with many wearing foil blankets that resembled those worn by children being held in detention facilities. Several prominent members of Congress, including Senators Tammy Duckworth, Kirsten Gillibrand and Elizabeth Warren, joined in solidarity with the protesters. Capitol police arrested at least 575 women for unlawfully demonstrating in the Capitol, including Rep. Pramila Jayapal and actress Susan Sarandon. 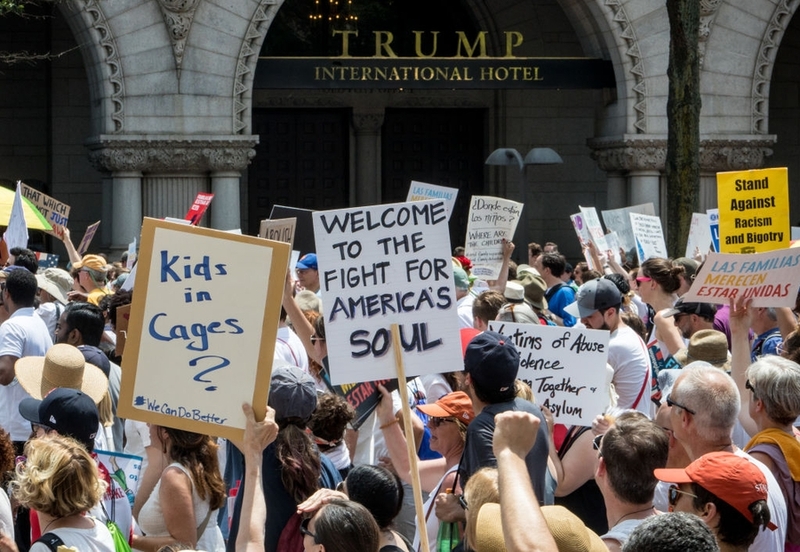 A few days later, on 30th June, tens of thousands of people marched in cities across the U.S. as part of a nationwide protest of President Trump’s policy on undocumented immigrants that left more than 2,000 children separated from their parents. As part of the "Families Belong Together" day of action, organisers say that as many as 700 rallies were held nationwide. Protesters marched by the White House and the Trump International Hotel in Washington, DC. In New York City, thousands marched across the Brooklyn Bridge and gathered outside Trump Tower to chant and wave signs against the president’s policy. In Atlanta, protesters carried dog crates with baby dolls inside them to represent the abhorrent conditions some families and children have been forced to endure. In late June and early July, large protests against Immigrations and Customs Enforcement (ICE) took place across the country, with protesters setting up encampments outside federal immigration facilities in cities like San Francisco, San Antonio, Portland, and Philadelphia. “We will be here as long as we can,” said one protester camped outside a San Francisco ICE building on 2nd July. In downtown Philadelphia, hundreds marched peacefully and called to shutdown ICE. In a separate incident in Philadelphia, 30 people were arrested after protesters clashed with police outside of an immigration facility. There were also reports of smaller counter-protests taking place near anti-ICE protests. In Louisville, for example, American Action Force 3%, an anti-immigration group, demonstrated in support of ICE. On 4th July, activists from Rise and Resist unfurled a banner that read “Abolish ICE” on the Statue of Liberty national monument to draw attention to the U.S. policy of separating migrant families at the U.S and Mexico border. At least six activists were arrested without incident by police. On the same day, police arrested Therese Patricia Okoumou for climbing the monument. Okoumou is a member of Rise and Resist but the group claims she acted on her own. As reported in the Monitor, the protests and occupations come in the wake of the Trump administration separating more than 2,000 undocumented children from their families as part of the president’s “zero-tolerance” policy. Though the administration said it would reverse course and stop separating children, the government continues to detain families and has yet to reunite all separated children with their parents. Hundreds took to the streets of Pittsburgh for three days to protest the shooting of an unarmed black man by police. Chanting "three shots in the back, how do you justify that? ", protesters called on local authorities to investigate why Antwon Rose was shot as he ran away from police on 19th June. "The video of this incident is deeply disturbing," said Governor Tom Wolf. Protesters blocked prominent streets and protested outside of PNC Park in downtown Pittsburgh. On 5th August, at least three people were hospitalized having been injured by crowd-control munitions fired by police during a right-wing rally in Portland, Oregon. Counter-demonstrators had come to protest a demonstration by far-right groups Patriot Prayer and Proud Boys, who had permission to hold a rally in a city park. The Patriot Prayer event, which drew a reported 50-100 participants and about twice as many counter-protesters, quickly became violent as the two sides met. According to eyewitnesses and the media, the police ordered the crowd to disperse and then began using pepper spray, flash-bang grenades and other weapons to break up the protesters, firing indiscriminately into the crowd. One protester was shot in the head by a flash bang grenade and seriously injured. Police arrested at least four people for assault on a public safety officer and unlawful use of a weapon. In a positive development, after a 15-month legal battle, the U.S. Attorney’s office announced on 6th July that it has dropped charges against all remaining inauguration day protesters. The announcement ends more than a year of trials in which most of the charges against more than 230 people arrested on 20th January, 2017 were dismissed. The defendants include freelance photojournalist Aaron Cantú who was swept up by police while covering the protests that day, and was charged with inciting a riot, rioting, conspiracy to riot, and five counts of destruction of property. Several former defendants have said that they plan to file formal complaints against Assistant U.S. Attorney Jennifer Kerkhoff, the lead prosecutor in the case, with the District of Columbia Office of Bar Counsel, because of the aggressive nature of the prosecution. On 10th July, a bill was introduced that would impose penalties on anyone who injures or threatens another person while wearing a mask at a protest. “The Unmasking Antifa Act of 2018”, introduced by Rep. Dan Donovan, would make anyone “wearing a mask” or in disguise who “injures, oppresses, threatens, or intimidates any person …” subject to a fine or up to 15 years in prison. Critics of the bill says that it is designed to discourage people trying to exercise their First Amendment freedoms. Since the last presidential election, at least 60 bills have been introduced across the country that would restrict or limit protest. "We are appalled by the shooting in the Capital Gazette newsroom. Newspapers like the Gazette do vital work, and our thoughts are with them amid this unconscionable tragedy." On 5th August, a masked man entered a Madison, Wisconsin radio station and opened fire on employees and volunteers, hitting one man who was taken to the hospital for non-life-threatening injuries. Police say the attack may have been perpetrated by a former employee, because there were no signs a of a forced entry and a code is required to gain access to the offices. Police are still searching for the shooter. A man who threatened to burn down a Texas-area television station and called the station manager a "dead man walking" was arraigned in court on 6th July after spending several months running from law enforcement. Jason Eric Bewley is charged with transmitting threats through interstate communications, according to The Hill. His motive is unclear. In a series of tweets from 14th July, Chicago Sun-Times reporter Nader Issa says that he was shoved to the ground by two Chicago police officers who smacked his phone out of his hand while he covered protests of the shooting of Harith Augustus. Issa says he was wearing his press badge and identified himself as a reporter, which didn’t stop the officers who “rushed [to] the parking lot and started hitting people”. A CNN correspondent says the White House retaliated against her after asking questions of the president in the Oval Office on 25th July. Kaitlan Collins says the president’s staff barred her from attending another press event that day because of her questions about Michael Cohen and Vladimir Putin. Trump did not answer any of Collins’s questions, but afterwards, she said Bill Shine, the White House’s communications chief, and press secretary Sarah Sanders told her that she wouldn’t be allowed to attend an open Rose Garden event “because they thought the questions that I posed to President Trump were inappropriate and inappropriate for that venue”. The barring of a journalist from an open event at the White House is believed to be unprecedented. Just because the White House is uncomfortable with a question regarding the news of day doesn't mean the question isn't relevant and shouldn't be asked," CNN said. “Each time the President calls the media ‘the enemy of the people’ or fails to allow questions from reporters from disfavoured outlets... he suggests nefarious motivations or animus. But he has failed to show even once that specific reporting has been driven by any untoward motivations." Law enforcement must first obtain a warrant before accessing an individual’s location using cellphone site tower records, the Supreme Court ruled on 22nd June. In its 5-4 decision in Carpenter v. United States, the court found that “because location information is continually logged for all of the 400 million devices in the United States—not just those belonging to persons who might happen to come under investigation—this newfound tracking capacity runs against everyone”. The ruling is a significant break from past decisions because it protects users’ data despite being available through third parties like phone service providers. This decision is viewed as a victory for the Fourth Amendment of the U.S. Constitution (the right against unreasonable searches) and was applauded by journalists and activists who rely on being able to keep sources and information private from government snooping. The government, however, can still access business records by obtaining a subpoena and in cases of emergency. "Perhaps the most significant part of today’s ruling for the future is its explicit recognition that individuals can maintain an expectation of privacy in information that they provide to third parties." "Censorship is the hallmark of authoritarianism and one of the most extreme measures governments use to control speech... We are relieved that the District Court has reversed its decision and vacated the order." As previously reported on the Monitor, on 28th September 2017, the Supreme Court agreed to hear the case Janus v. American Federation of State, Municipal and County Employees to examine whether government employees’ First Amendment rights are being violated by certain union practices. On 27th June 2018, the Supreme Court ruled that public sector workers cannot be required to pay fees to unions that they do not belong to. In a 5-4 ruling, the Court struck down an Illinois law that required non-union workers to pay fees that go toward collective bargaining efforts and overturned another law that required employees to pay fees related to employee grievances, physical safety and training. Nearly half of the states have laws that allow for public employees to pay those fees, and proponents of the Court’s ruling say those fees, which sometimes were directed toward political activity, infringed on their First Amendment rights. Critics of the ruling say this will weaken unions and lead to the elimination of many programs and services that protect both union and non-union public sector employees. Law enforcement agents are using undercover distribution of cell phones to provide backdoor access to suspects’ data and potentially subjecting non-targets, including human rights defenders, to federal snooping, according to a Human Rights Watch report. Raising questions about the boundaries of surveillance, the report identifies two methods by which electronic devices, such as cell phones, are manipulated so that their data and messages are accessible to law enforcement. “One involved the undercover sale of BlackBerry devices whose individual encryption keys the DEA possessed, enabling the agency to decode messages sent and received by suspects. The second, as described in a previously unreported internal email belonging to the surveillance software company Hacking Team, may have entailed installing monitoring software on a significant number of phones before attempting to put them into suspects’ hands,” according to HRW.